Who hasn’t dreamt of living amongst the rooftops of the city? 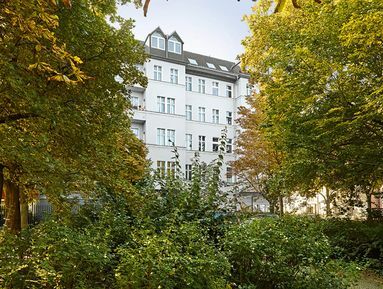 In this fantastic 3-room attic apartment at Goslarer Platz, your dream can come true! With a wonderful layout spread over 113 sqm, you can enjoy a lot of light, space, peace and quiet, as well as a wonderfully inviting roof terrace, which leads off from the huge open-plan kitchen/living room. With a bedroom, an office, and a storage room, this apartment would make a fabulous home. It is sold in its undeveloped state.